New York construction workers run over by heavy operating equipment, such as dump trucks, front end loaders, fork lifts and backhoes account for numerous injuries and deaths each year. These incidents occur from the negligent and careless operation of vehicles and equipment, negligent maintenance of the equipment and inadequate supervision on construction sites. The United States Department of Labor’s Occupational Health & Safety Administration (OSHA) has established a variety of regulations to try and reduce the number of workers killed and severely injured by heavy operating equipment. Unfortunately, despite the efforts of OSHA, many owners and construction companies fail to follow the safety regulations established by OSHA. In order to prevent these types of incidents from occurring, contractors utilizing heavy moving equipment must ensure that the operators of the equipment have been properly trained to use it and have been thoroughly trained in the use of all safety devices on the equipment. In addition, owners and operators of the equipment must ensure that all safety devices are properly maintained and are operational. These devices include back up warning alarms, back up lights, mirrors and back up cameras. Unfortunately, whether due to operator error, or a failure to maintain a safety device, workers are run over by operating equipment and severely injured or killed every year on job sites. Fault may lay with the owner of the heavy equipment, the operator, the owner of the construction site, the general contractor, subcontractors and various others. Determining who is at fault for a worker being run over by operating equipment requires a thorough understanding of the various laws of New York and New Jersey, in particularly the Labor Law of New York §240(1), §241(6) and §200. The NYC Construction Accident Attorneys at Gair, Gair, Conason, Rubinowitz, Bloom, Hershenhorn, Steigman & Mackauf have vast knowledge in these areas of laws. In fact, the firm’s attorneys have been asked to lecture time and time again to other attorneys, judges and other legal professionals on the various construction laws. Injuries at construction sites require a thorough investigation. When workers are injured, there are a variety of vital documents which may be created such as incident reports, OSHA investigation reports, and workers’ compensation reports. There may also be photographic or video evidence depicting the incident. Additionally, there may be equipment maintenance records and inspection records related to the piece of equipment involved in the incident. 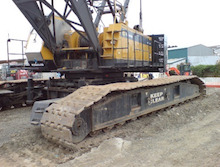 Having helped workers who have been run over by operating equipment for over 90 years, the New York Construction Site Injury Attorneys at Gair, Gair, Conason, Rubinowitz, Bloom, Hershenhorn, Steigman & Mackauf are familiar with all of the documents, reports, and other materials that are necessary in order to obtain compensation for their clients. In addition to collecting evidence in order to prove that a party is responsible for a worker beginning run over by operating equipment, it is necessary to collect evidence of the harm that the injured party suffered. Workers who have suffered severe injuries or death, are not only entitled to compensation for the physical and emotional harm of their physical injuries, but are also entitled to economic damages for their loss of wages and benefits. To assist in proving economic damages, our NYC run over accident attorneys utilize top economic and financial professionals to aid in helping our clients receive the economic compensation that they rightfully deserve. If you or a loved one has been seriously injured or killed as a result of being run over by operating equipment on a construction site, it is critical to speak with an attorney who has a firm grasp of the various construction and labor laws. The New York construction site injury attorneys at Gair, Gair, Conason, Rubinowitz, Bloom, Hershenhorn, Steigman & Mackauf have an abundance of experience in representing injured construction workers. Please contact us today.